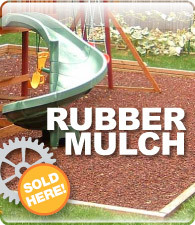 Quick Overview Playground Rubber Mulch has endless benefits... - Safe for Children - Protects kids from most common playground injuries resulting from falls! - Pliable surface to reduce stress on joints and bones! - Inhibits growth of molds and fungi. - Non-Toxic - Reduces Weed Growth - Safe for Plants - Does not attract Insects! - Allows 100% of water and fertilizer to reach the soil! - Holds moisture in the soil so you water less! - Does not Decay - Stays looking new for 5-8 years! - Nearly Maintenance Free! - Will not float or blow away. - One Pallet covers 300sq. ft. at 3 in. deep!